Lost Boy Cavern is a large cave far east of Bravil containing necromancers (quest-related). It contains four zones: Lost Boy Cavern, Lost Boy Canyon, Lost Boy's Yawning Halls, and Lost Boy's Hidden Bastion. This cave contains 11 Cairn Bolete plants and 8 Wisp Stalk plants. 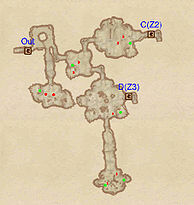 The last section of this cave has the Editor ID LostBoyCaverns05, even though there are only 4 zones. LostBoyCaverns04 does not exist. If you are not yet level 23, do not enter the last zone of this cavern, Lost Boy's Hidden Bastion, unless you are willing to never fight Erandur-Vangaril. 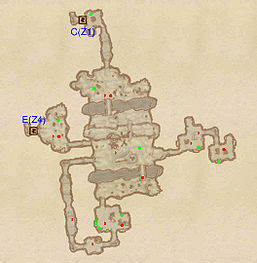 If you enter the bastion at lower levels, you will be unable to attack or interact in any way with Erandur-Vanagaril — even if you later return at a higher level. 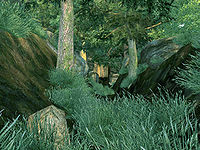 This location's map marker (M on map) is named Lost Boy Cavern (editor name LostBoyCavernsMapMarker). The entrance door is E of the marker, 100 feet away. In this level you immediately start at an intersection: right is a small room containing two enemies and a minor loot chest while left is the main part of the current zone. In the next room you will again find yourself at an intersect: right is door D to Lost Boy's Yawning Halls and a corridor, further ahead, leading to a small room with up to two enemies and two minor loot chests. Take left to enter a room with up to two enemies and door C, to Lost Boy Canyon. You enter this level through door C and find yourself in the main room of this level. Here you will find the 'canyons' that give the name to this zone. The first and last are two chasms, and you will die if you fall into one. The middle one is a lower part of this zone that can be accessed from Lost Boy's Hidden Bastion. In the central part of this room there is an intersect: left are two rooms containing only enemies and minor loot chests. If you take right, you will wind through a corridor and two small rooms until you will find yourself at the far end of the large room. To continue you will have to fall down the middle canyon (fall damage is minimal) until you arrive at door E to Lost Boy's Hidden Bastion. You can enter this zone from both Lost Boy Cavern (door D) and Lost Boy's Hidden Bastion (door F). It is advisable to enter from the latter, as it provides the only way back to the first level. 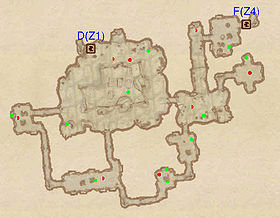 After a long corridor you will find yourself in a room where three corridors depart: to the left is a small room containing an enemy and a minor loot chest, right is the quickest entrance to the largest room in this zone while straight ahead will take you through a series of corridors and rooms until you will find yourself at the opposite end of the large room. This last route is better since you won't miss out on any loot. The large chamber contains two enemies and, on a lower level, the door (D) to Lost Boy Cavern. Like the third zone, you can enter this level from both Lost Boy Canyon (door E) and Lost Boy's Yawning Halls (door F). It is advisable to enter from the first, since only a small portion of Lost Boy Canyon can be accessed from this level. When entering you will find yourself in a large room with up to two enemies. You are, however, on a lower level, initially, so fighting might be challenging. The next room is quite interesting: apart from containing up to three enemies it also holds one of the several "drunken goblins" in Cyrodiil and what were Vangaril's quarters. Here you will find, distributed on two tables and a ledge, a full set of Novice Alchemy apparatus, five soul gems, a silver dagger, three notes and two heads: a zombie and a skeleton one. From here you are forced to go up the stairs, as gate G is locked. These will lead you to a room with two enemies, five chests and two stone slabs (b), which can be used for sleeping. 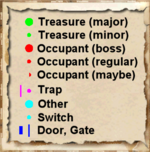 One of the chests, k, holds the key to open the gate at G. In the next room, if you are level 23 or over, you will find the Lich Erandur-Vangaril (A) along with the boss-level chest (B) and a skeleton corpse. 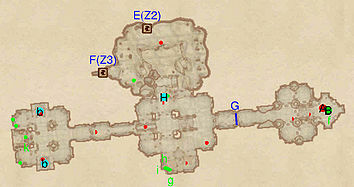 1 Dead Goblin (may carry a lockpick) perched on an inaccessible archway at location H on map (over the stairs connecting the initial cave with the first fort-like room). You'll know you're crossing under the archway when you see several beer bottles strewn about the floor. It is possible to jump and open the chest if your Acrobatics is high enough (>75 is a good bet); it is also possible to jump from the top of the rock pillar near the archway.